Given the huge growth in eCommerce over the previous decade, it comes as no surprise to see a variety of digital currencies – most notably Bitcoin – also increase their popularity. Bitcoin’s decentralized nature relies on a peer-to-peer system design, with all transactions recorded on a singular ledger known as a blockchain. 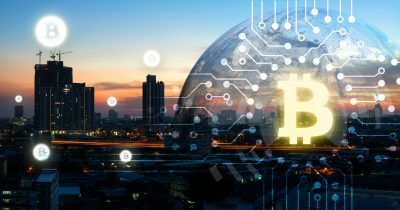 Anyone working in the technology industry needs to stay abreast of Bitcoin and other similar currency systems, in case they end up working on a product interfacing with this latest industry innovation. What follows is a high-level overview of Bitcoin to help you better understand its impact on the technology world and beyond. Bitcoin provides an easy-to-use online interface to pay for products and give or receive digital currency, also known as cryptocurrency. A user creates a Bitcoin wallet on their smartphone, desktop computer or other mobile device. Along with a private key generated by the wallet, each Bitcoin transaction creates a unique address, similar to using email, but Bitcoin recommends only using each address one time. It is also possible to exchange “bitcoin” for other currencies or products, on both legal and black markets. A blockchain serves as the centralized ledger for the entire currency system. Each confirmed transaction gets entered on the ledger, leveraging cryptography to ensure a secure transaction and an accurate chronological order. As a currency, Bitcoin is subject to the same twists and turns in the worldwide market as other traditional forms of money. This year, its price is up 210 percent since March, trading as high as $2,900. Investment expert, Raoul Pal commented on the volatile nature of Bitcoin. “The explosion [in the price of Bitcoin] is mania. It’s people looking for a rate of return. It’s in the bubble phase. [Bitcoin] goes through this periodically… it rises several hundred percent, and then collapses,” said Pal. Because of this volatility, some feel a measure of regulation is necessary to legitimize the cryptocurrency. There’s no denying the model of a peer-to-peer currency system using a blockchain isn’t going away, whether it’s Bitcoin or some other system. Anyone working in the high-tech world needs to familiarize themselves with these latest innovations in eCommerce. Are you looking for an IT job in the Boston Area? If you need additional insights on the constantly changing technology industry, talk to the experts at The Ceres Group. As one of the top IT staffing agencies in the Greater Boston area, we can help ensure your success in this rewarding field. Contact us today to find a new IT job. ← What Is the Future of Cloud Security? But its gaining popularity among masses quite rapidly, Japan is also going to recognize Bitcoin as a legal method of payment. There are several Bitcoins exchanges around the world where you can exchange other currencies with Bitcoin .